Traditionally, Apple products have never required anti-virus software. Any apps developed for iPhones are required to go through an extraordinarily stringent testing process in the Apple labs to ensure its virus free and meets their strict community guidelines. Recently, however, certain users have reported occasional attacks, especially those who (through a process call jaibreaking) have changed their default operating system in order to download third party apps. While this process can be tempting for those who like to push the envelope of their phone, it also leaves your device wide open for malware. And even for those who haven’t done this, a group of researchers Georgia Tech University have created something they’re calling the ‘Jekyll Gambit’, an ingenious method for concealing malware within APPS so subtly they can be accepted into the Apple store without discovery. Since we have the latest iPhone XS, iPhone XS Max and iPhone XR running the latest iOS 12 or updated versions of iOS 12.1 or even the iOS 12.1 Beta 4. All these devices released recently so we have gathered the top 5 Antivirus apps for our readers to download and install them on their devices to make them secure and safe from ever growing viruses, spams or malware. Top 5 Antivirus apps for iPhone XS, iPhone XS Max and iPhone XR. Available for both Android and Iphone, this nifty security APP sports a minimalist aesthetic in the vein of popular social networking sites, making it simple to use and easy on the eye. Fire up the APP and you’ll see a newsfeed type homepage with updates of your current security status, as well as features like backup, missing device, safe browsing and privacy advisor. Scans and backups can be scheduled, which is impressive, as is the level of APP security: Lookout scans all the APPS you’ve installed already for possible security breaches. All in all this is a worth purchase indeed, not least of which because if your phone is stolen, Lookout will help you track it from your computer, recording the last known location of the phone before the battery runs out. There’s a free version, as with most apps, but to our mind the premium version, with remote lock and wipe make it worth the spend. The iPhone version of the popular AntiVirus detective is another solid solution for keeping pesky malware off your phone. Open the APP and your eyes are greeting with a decision tree, offering a range of actions for dealing with perceived threats to your system. Once an alert is triggered, users simply follow a YES or NO process, then offering suggestions for downloadable tools made by most of the major commercial malware removal vendors (Symantec, McAfee, Trend, & Kaspersky), as well as online resources for perform analysis on the suspect files. This dedicated Apple App works on the full range of devices such as iPad and iPod Touch, and of course your trusty Iphone 6. Made by Indian company Max Secure, this App prides itself on being able to detect the Jekyll Virus, as well as offering on demand virus scanning for email attachments, remote locations and dropbox folders. With its regular updates and round the clock support, this solid Application is a decent way of protecting your phone. This popular anti virus regularly scored above 90% in Tech Advisor reviews, meaning it’s highly effective at keeping your system safe. Dr Web is the brainchild of a Russian anti malware company and is quickly earning itself a reputation for reliability, though some reviewers suggest the ‘light’ version is not quite powerful enough. The main version, however, removes ransomware, neutralises lockers, and prevents SD cards from becoming infected. Dr Web’s developers have also tuned it to economize battery resources. All in all a handy piece of kit. 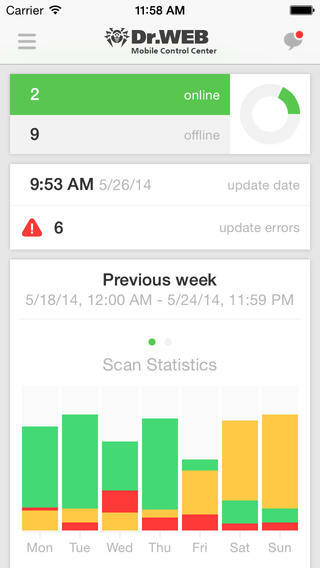 This nifty APP is really a news tool over an actual first aid kit for viruses. Free to download, it offers users real time information via reporting ongoing vulnerabilities. Its threat feed, audio parasitic podcasts, and domain query tool give iPhone users a useful method of staying up to date with the murky world of malware. If you want to scan and detect viruses, however, you’ll need one of the other tools. We have brought the best of the best Antiviruses for your iPhone XS, XS Max or the iPhone XR. Since all these devices runs on the same A12 bionic chipset, so these Antiviruses are quite good to work on any device. You can also get the best Android antiviruses in our upcoming posts.